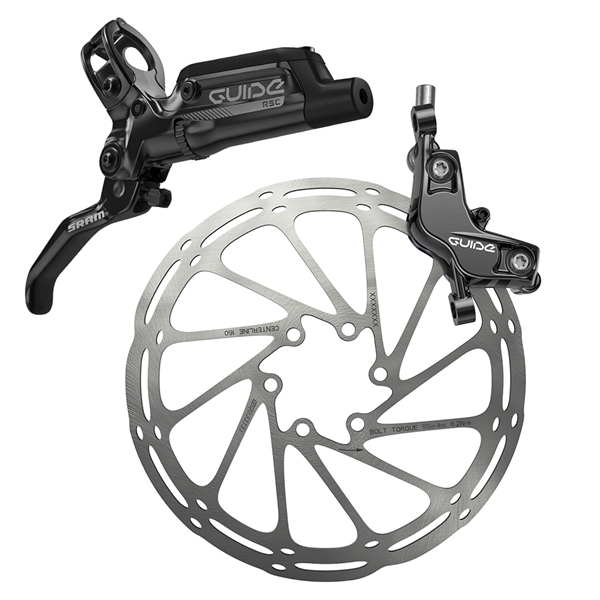 Product information "SRAM Guide RSC Disc Brake - black"
Now featuring the World Championship-winning S4 caliper with Bleeding Edge™ and Heat Shield technologies. The new SRAM Guide RSC is packed with ride-enhancing performance that makes every new trail a trusted old friend. We started from scratch, to create the perfect combination of braking reliability and control. Brand-new SwingLink™ technology provides more power, silky-smooth modulation, less deadband and better lever-feel than you've ever experienced. Steep-line confidence. Deep-corner dominance. Ride every trail like you own it. KNOW YOU CAN. Squeeze a new SRAM brake lever and you notice it immediately. Less deadband. More positive pad engagement. A new cam system requires less lever throw to push the pads toward the rotor. That's great, but there's more to perfect braking performance than just power. You need control. Many brake systems minimize deadband—but at the cost of modulation. SwingLink solves that with its special cam shape. When the pads contact the rotor, power is modulated, avoiding that "on/off" brake feel. It's the perfect balance of power and precision. SRAM's new brake lever design includes a reshaped bladder, called Pure, that helps regulate and reduce air bubbles. The bladder is specifically shaped to evacuate air from the lever and push the fluid exactly where it's needed. The result is improved back-pressure relief, which produces dependable braking power and consistency. A hydraulic brake's timing port is the connection between the reservoir and the master cylinder bore. When the lever is squeezed, a cup seal passes this area and closes the port, which pressurizes the system. SRAM's new timing port closure system features durable seals and an ultra-smooth cylinder bore finish, producing dependable braking power and consistency. Precision sealed bearings at the lever pivot enhance the clean, crisp lever actuation and consistent, light, one-finger feel. The brake includes a brake lever, caliper and line, which is filled and bled. Related links to "SRAM Guide RSC Disc Brake - black"
Customer evaluation for "SRAM Guide RSC Disc Brake - black"